All homes currently listed for sale in the zip code 90036 as of 04/26/2019 are shown below. You can change the search criteria at any time by pressing the 'Change Search' button below. "Modern Home RETREAT by Architectural Digest acclaimed designer/builder Adam Rimon. Nearly 6000 sq. ft of Indoor/Outdoor Living area on a 7413 sq. ft Lot. You will never believe you are in the midst of Hollywood/Melrose/Beverly Grove. The oversized lot with a large grassy yard, Pool Waterfall, Baja Deck Spa brings a ZEN presence to your surroundings. The Control 4 smart home has Open floor plan, Fleetwood glass doors, high ceilings, great room with large Italian porcelain tile flooring, entertainer chef's kitchen with quartz waterfall island, finest appliances, custom European style cabinetry, climate-controlled Wine Closet. Master suite with Fleetwood doors that open to the private balcony, fireplace, Wet Bar with Refrigerator and walk-in closet flooded with natural light. Master Bath with a steam shower built for two, soaking tub, and see thru fireplace. Rooftop Deck with Firepit, Wet Bar/ refrigerator, and 360 views of Downtown, Hollywood Sign, Griffith Observatory, all points west"
"Stunning 2018 Modern in Prime Beverly Grove! Located in LA's hottest enclave, this entertainer's paradise was built barring no expense. Positioned on a rare, oversized lot w/ huge backyard and private cabana. Featuring 5 well-appointed bedrooms and 6 bathrooms. Chef's kitchen boasts Thermador appliances and quartz center island. Kitchen flows into breakfast area overlooking backyard with built-in BBQ and free standing fire pit. Bright living room flows seamlessly outside through Fleetwood glass walls. Control 4 smart home system maintains presence offering unrivaled ease of use and advanced technology for lighting, sound, security and entertainment. Functions include gates, 5-ton HVAC system, heated pool w/ low volt lighting and pre wiring for cable/ Wifi. Equipped w/ fire sprinklers, drip landscaping and central vacuum. Upper level comprised of 4 en-suite bedrooms including luxurious Master w/ dual walk-in closets. Relax outside on the Pebble Tec balcony and enjoy the panoramic views!" "Stunning newer construction home in Beverly Grove, where style meets substance in the finishes, design and location. This gated architectural home is close to Melrose shops and restaurants, and a short drive to the Grove, West Hollywood and Beverly Hills. The loft-like open floorplan has high ceilings and opens through full-height Fleetwood sliding pocket doors to a very private backyard for entertaining with a zero-edge pool and large patio with fire pit and multiple seating areas. The kitchen features Miele appliances and a huge island. There is a bedroom suite on the main floor, plus three more bedroom suites upstairs, including a spectacular master suite with double walk-in closets, and a lavish spa-style bath. There are views of the Hollywood Sign, several spacious balconies and a smart home network that includes Lutron, DoorBird, Nest and Sonos systems. An oversized two car garage plus additional off-street parking make this wonderful compound a perfect retreat." "This stunning, custom designed Contemporary Spanish home is ready to welcome its new owners! 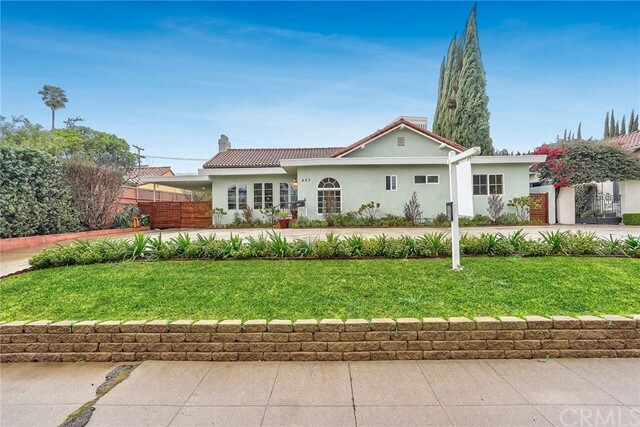 Magnificently remodeled and located on one of the most desirable streets in Hancock Park, this family home offers an amazing floor plan with over 4,000 SF of living space. We invite you to enter into a center hallway leading to beautiful living room with high beamed ceilings, seamlessly flowing into a grand dining room & chef's kitchen, with huge center island boasting quartz counters & top of the line appliances. Step down into a family room with French doors opening up to a private and beautifully landscaped garden, lovely patio and garage/outdoor cabana, with half bath. Family room can also be used as a guest bedroom as it has its own bathroom. Front office/library, delightful den off the kitchen and powder room complete the downstairs. 2nd story offers 5 spacious family bedrooms and 4 baths, including bright master suite. Home is wired for security cameras and sound system." "Entertainer's dream in Prime Beverly Grove! This beautiful home features a light filled open floor plan w/7 bedrooms, 8bathrooms & over 5,200 sq ft of living space. Located on a quiet street just steps from all the high end shops & restaurants the Melrose district has to offer. The recently constructed home sits on an oversized 7,334 sf lot, boasts a spacious 2-story floor plan w/large basement media room, high ceilings, recessed lighting & distressed oak hardwood floors. Chef's kitchen includes large center island, Viking stainless steel appliances, marble countertops, dual sinks & three ovens. Step into the sun drenched living room w/pocket doors that open to a beautiful and private backyard equipped w/ a full size pool, spa, fire pit, BBQ, waterfall & gazebo! Enjoy the large basement featuring a media room w/built-in movie projector, wet bar & wine cooler. Move upstairs to the spacious master suite w/large walk-in closet, fireplace, private balcony, soaking tub & rain shower." "Napa Contemporary home on a large lot, situated on a historic street lined with beautiful old-growth trees. Featuring timeless designer finishes and the highest level of craftsmanship, this sun-filled open floor plan with a grand entry foyer has abundant windows and glass doors which blend the indoor space with the lush outdoor landscape. Gourmet kitchen with Thermador six burner double-oven with griddle, Italian Carrera Marble countertops and elegant cabinetry with an eat-in bar. Four bedrooms including an expansive master suite with master bathroom clad in beautiful marble tile work, Victoria + Albert soaking tub, glass-enclosed shower and a dual vanity. Pool and hot tub with large deck for entertaining guests or dining al fresco. Minutes to Beverly Hills, West Hollywood, LACMA, world-class restaurants, entertainment and more!" "This five-bedroom, five-bathroom home is a modern sanctuary with an exquisite coupling of flow and functionality, an artful, gallery aesthetic and seamless indoor-outdoor living. Towering windows draw the outdoors in, high ceilings add depth and scale, and glass pocket doors disappear into the walls opening to the private outdoor living area with pool and spa. Featuring innovative architecture, exquisite design, elegant finishes and fixtures, 637 Gardner is centrally located in the Melrose District and just minutes from acclaimed shopping, dining, and nightlife." "This sophisticated decorator done Spanish compound, gated and hedged for privacy, offers classic 1920's details and modern updates in desirable Hancock Park. A unique juxtaposition of old and new, the formal entry leads to the incredible step-down living room with wood burning fireplace, magnificent vaulted beamed ceilings and multiple French doors that open to the 331 sqft dining and living loggia. The formal dining room with built-ins opens to the well-appointed gourmet kitchen featuring center island/breakfast bar and spacious family room with Nanawall sliding glass doors flowing to the lushly landscaped yard with pool, spa and fire pit. Upstairs, master suite with private bath and 2 additional bedrooms with Jack and Jill bathroom. The 2-story guest house with den, bedroom, bath and loft provides room for guests or work. The upgrades include solar system, Nanawall door systems, Lutron lighting and security." "BEAUTIFUL GRAND DUPLEX located in HANCOCK PARK w/tree lined Sycamore trees, this elegant duplex offers 7 BR/5 BA combined.Up 4BR/2.5BA about 2950sf. Down 3BR/2BA. 2 story Foyer Entry w/grand winding staircase w/original stained glass windows & elegant Powder Room.Off of the Upstairs Entry Hall is private Den/Office or can be converted to a BR.Huge Living Room w/Beamed ceilings & restored fireplace. Large formal Dining Room can seat up to 12 comfortably. Breakfast Nook off Kitchen can seat an additional 6 persons & has a built-in butlers pantry for storage.Kitchen has 2 skylights that allows natural daylight to illuminate the area. Large separate Laundry Room w/sink, pantry, space for a 2nd fridge & access to the 2nd BR. Large Master Bedroom w/dressing table area & 2 walk-in closets.Large Master BA w/2 separate vanities w/limestone counters w/Bronze tile accent trim, frameless shower w/rain shower & hand shower. 2 additional bedrooms w/walk-in closets.Other Unique Features include Coved Beamed ceilings, Arched Doorways, original Hardwood Floors,walk-in Cedar closet,lots of extra closets for storage.Unit has full circular flow. Downstairs unit is similar w/3 BR,2 BA. Additional Storage rooms adjacent to the 4 car garage.Large California basement area for additional storage. Built in 1920's this Grand Architectural Gem is a rare opportunity in Hancock Park. It is a great location -walking distance to shops,markets,Synagogue, Schools, 3rd Street School district. Private Showings." "Spectacular turnkey Tudor with endless character and charm. Located in the heart of Carthay Square, minutes to the best of Beverly Hills and West Hollywood, this totally private and gated compound has it all. Enter through front courtyard with beautiful outdoor fireplace - large and bright living room with soaring ceilings, generous and sleek open kitchen with high-end stainless appliances, tremendous master suite with spacious bathroom and huge walk-in closet, hardwood floors throughout, relaxing backyard with pool/spa, rooftop lounge, 2 story guest house with full kitchen, bath, laundry and bedroom loft. Very rare offering in one of the most prime locations in the city." "*BACK ON MARKET- BUYER COULD NOT SECURE A LOAN* A true gem 3 years in the making, 342 N. Highland has been refurbished & remodeled from top to bottom with permits and retains a historic grandeur that is now coupled with present-day beauty. A beautifully arranged courtyard with fountain welcomes you into this 4 bd,4.5 ba property. The home features hardwood & tiled floors, new LED recessed lighting and paints, grand living room with fireplace,dining room & den. 2 brand new & exquisitely designed kitchens are provided for families requiring them, complete with brand new cabinets, hood & quartz countertops. A stunning staircase and restored 1920s painted dome ceiling greet you upstairs. The upstairs features brand new tiled bathrooms & showers, a sun-room, 1 tub with jets, brand new vanities & toilets, spacious rooms with large closets, & brand new hardwood floors. Laundry room, AC, 2 car garage, paved driveway, huge multi-use basement, brand new sparkling pool, and so much more." "Exceptional modern home in the heart of Beverly Grove and the Melrose District. The newer constructed European design creates an incredible charm that clearly distinguishes itself from the rest of the marketplace. Large, yet intimate floor plan with lots of natural light. The main living spaces open completely into separate yards surrounded by tall hedges, one with a lounge area, pool and spa, the other with a dining patio, perfect for hosting large dinner parties and entertaining guests. Stunning gourmet kitchen with top of the line Thermador appliances. Light oak wood floors throughout. Upstairs includes 2 bedrooms plus a sophisticated master suite with a large soaking tub, rain shower and dual sinks. Lower level basement with media room, full bath and bonus area that has many flexible use options. Property has integrated Control-4 smart home system with indoor/outdoor surround sound. Centrally-located a couple blocks from shops and restaurants on Melrose and the Grove." "Walk into this stunning 2-story custom designer home, rebuilt in 2003, and be amazed at the breathtaking cathedral ceiling and gleaming Jerusalem marble stairway in the foyer. You will find exquisite and unique features throughout the spacious home. On the main floor, the formal living room has a faux finish cast stone fireplace and the open concept kitchen/family room is an entertainer's dream, with an abundance of solid maple cabinets and is equipped with two sinks for observant families. The entire second floor boasts solid Brazilian cherrywood flooring. Relax in your large master suite with a huge walk-in closet that includes custom maple cabinetry. In the master bath, no expense was spared with the Grohe fixtures, wide oversized tub, separate shower, marble floors, double granite sinks. An interior sound system has been installed, in addition to a home security system. Eco-friendly touches include tankless water heater, whole-house attic fan, underground rainwater drainage system, soundproofed windows, and dual climate systems. The beautiful exterior design elements include crown molding and a stacked stone chimney while the backyard showcases a solid redwood pergola and porcelain Italian tiles." "Welcome to a true California Oasis. Hedged with 100 mature trees & gated for privacy, this smart home has been spectacularly renovated blending a mix of Spanish design & modern lines. Natural light abounds throughout the space highlighting designer finishes & exquisite details. Wake up to elevated ceilings in the master bedroom, as you fall in love with the ensuite bath, finished with Heath & Cle tile, featuring a steam shower & separate soaking tub. The exposed beamed ceilings, curved entry ways & fireplace in the living room ground the original architecture. The gourmet kitchen features a large island, Miele appliances, & opens to a stunning garden area. The grounds include a glimmering pool, built-in gas BBQ, & a bonus casita. Olive, citrus, & magnolia trees surround, creating green sight lines from every window. Solar Panels & an EV charger make this home not only chic but green! Blocks to Jon & Vinny's, Fairfax, & all The Grove has to offer. The one you have been waiting for." "This enchanting home is situated on approximately 10,510 square feet of beautifully manicured lush green lawns and it's surrounded by beautifully landscaped flowerbeds that are bursting with vibrant Spring colors. This approximately 3,510 square foot home boasts three large bedrooms with two full baths upstairs, and one bedroom with one and a half baths on the downstairs level. The large open kitchen is beside an expansive dining room that connects to a large and inviting living room with a tall ceiling and an elegant fireplace. A wide sweeping stairway leads towards the front door. This gorgeous home is minutes away from LACMA, The Grove at Farmers Market, Trader Joe's, Larchmont Village and Mozza Italian Restaurant. This property is mid-block between 6th and Wilshire." "Set back on a beautiful tree-lined street in prime Beverly Grove, Miracle Mile North HPOZ sits this traditional home that has been beautifully upgraded over the years, including a 2nd story addition, making this home a fantastic 4 bedroom 3.5 bath, over 2700 sqft home including an upstairs & downstairs master suite. Warm & spacious living room with a beautiful large bay window facing the front, formal dining room with hardwood floors and a great wet bar lead into the enormous centerpiece of any home...THE KITCHEN! From two stoves, double ovens, two sinks, large walk-in pantry,this kitchen has it all! Great open concept between kitchen and family room. French doors leading out to a private and tranquil backyard with tiled patio/deck and trellis, large grassy area creating the perfect outdoor entertaining space. All bedrooms up and down have on suite bathrooms. Close proximity to original Farmers market, museums,The Grove, the library, and Pan Pacific Park. Fantastic opportunity!" "HOUSE HACKER'S DREAM COME TRUE!! 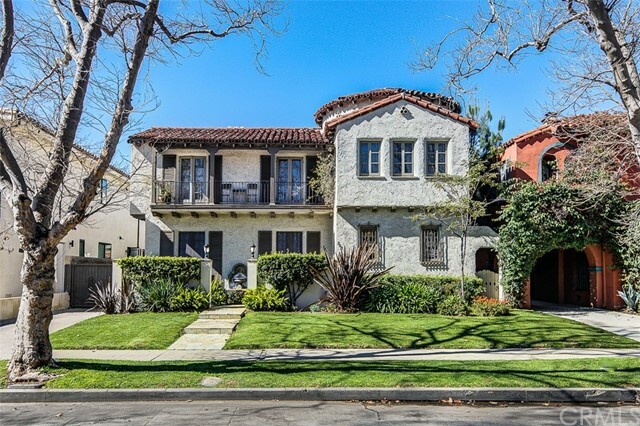 Originally built in 1926, this lovingly maintained 4bd/4ba Storybook Tudor sits on a generous 7,699 SqFt corner lot. Blending historic period details with select updates, the spacious 3,288 SqFt home includes many high-quality improvements while allowing for a great deal of untapped potential for next owner to realize. One of the most notable features is a bright, modernized 2nd-story loft with private entrance feat kitchenette, full bath, & stackable w/d, which provides great potential under the new short-term rental laws, or for a multi-generational housing arrangement. Large private backyard features ample deck and patio space and detached 2 car garage (which could bring more opportunities, if converted into an ADU). This beautiful home is also situated in the heart of the Miracle Mile, near 2 soon-to-be completed Purple Line metro stations, as well as popular museums such as LACMA, the Petersen Auto Museum, and the upcoming Academy Museum." "Location, Location!!! This Contemporary Mediterranean home feat. 2,658 sq ft with 4B and 4 full BA + bonus room which can be used as an option for den, office, or media space. This home boasts a large open floor plan with French doors that lead you outdoors to the grassy, private backyard. Sparkling pool and hot tub make for an entertainers delight. Designer details incl wide plank dark pecan hardwood floors, crown molding, vaulted ceilings and recessed lighting throughout. Dual zone air/heat keep you comfortable all year long. Gourmet kitchen has granite counter tops, high-end SS appliances, wine fridge, custom cabinetry and a central island with breakfast bar. Master + 2 beds located upstairs and addt'l full bed and bath downstairs. Parking incl 2 car attached garage with gated drive and entry. Located just a 1/2 block from Melrose in West Hollywood, the Sunset Strip, restaurants, high-end retail, art galleries, and renowned entertainment venues. Property appraised at $2,325,000." "Historic, hedged and private Spanish-style residence built by famed LA architect John Byers in 1927 and once home to Congressman and L.A. District Attorney, John Dockweiler. Full of potential, this 3BD/3BA home features lots of natural light, arched doorways, built-ins and original hardwood floors. Over-sized, sun filled living area with fireplace and large windows. The dining room can accommodate a large group for dinner or step outside to the private courtyard for dining al fresco. The kitchen is waiting to be created into something special and is very spacious. Master bedroom has views of the backyard, exposed beams and multiple closets including a 7x13 walk-in. Two additional guest rooms (one upstairs, one downstairs) both with ensuite bathrooms. The lot is just under 8,000 sq.ft. with mature hedges and large outdoor entertaining areas. Pool is set at the back of the lot and receives sunlight most of the day. Outdoor shower and well-maintained landscaping complete the backyard." "Romantic and private Spanish style home, approx.. 2,000 sqft. of beautiful living space with original features and modern finishes. Gorgeous bamboo wood floors and recessed lighting throughout. Large living room with fireplace and open dining area. Spacious cook's kitchen with granite countertops and stainless-steel appliances. Includes 3 bedrooms and 2.75 baths, master suite with spa tub and dual sinks. Huge backyard with grassy lawn and covered dining patio, perfect for entertaining. Gated front entry creates extra privacy. The home is located within immediate proximity to the famed shops and restaurants on Melrose and the Grove, creating the classic Los Angeles lifestyle." "5 Bed - 4.5 Bath. Excellent location, recently remodeled and on a quiet street near Wilshire Blvd and La Brea Ave. Beautiful open spaced floor plan with wood beam ceilings in living room. Modern, elegant, and luxurious styling through out. Two kitchen islands!, chevron pattern floor tiles, breakfast bar, enormous gourmet kitchen equipped with stainless appliances. Walk upstairs through the sweeping staircase lit by a grand skylight awaits TWO Large Master Suits with large Walk- in closets, granite counter tops, soakertub, private balcony with french door opening. Conveniently located near Purple line and amenities in Miracle Mile. Must come to see this gem!" "Designer touches and sophisticated character fill this beautifully remodeled, ultra-private home in the sought-after Beverly Grove area. Wide-plank floors and stone fireplace set a chic tone in the oversized living room with separate spaces for formal and informal entertaining. A spacious dining room flows to the eat-in kitchen featuring custom cabinetry topped in Caesarstone & Carrara marble, a massive island and top-notch stainless steel Viking appliances. Delight in two large master suites, each with a private and luxe ensuite bath and direct outdoor access. A third bedroom and well-appointed guest bath round out the main house, while a detached office or bonus area delivers a private escape. Enjoy lush lawns and a spacious wood deck with tall hedges providing privacy on all sides. Situated in the Miracle Mile North HPOZ, this A+ location puts the best of LA within minutes of your front door, including The Grove, Farmer's Market, Pan Pacific Park and the best restaurants and shops."